Where the heck is Po? This week (and a week more or so), I'm back in Bangalore to see my boy "A" before I finally head back to NYC. For some reason, starting from last month, I was getting some really excruciating headaches around this time of the month. Last month, I was with my family in beautiful Redang Island so I thought this headache must've been caused by the heat and overexcitement of being around the pearly white sandy beach and crystal clear blue water. I found out this month, it's probably due to some hormonal changes. After taking 5-6 pills a day with little relief, I gave up on paracetamol and gave in to my dad's nag. My family has this traditional remedy call "pau sa" where you scrape the skin on your back with a porcelain spoon and salt water when you suspect your body have too much "heat". Excess "heat" in the body is believed to cause fever, headache, etc, so scrapping your skin till it becomes swollen and red will release the "heat". It doesn't look pretty and hurts like hell. This one here is done with fingers instead of a porcelain spoon. Using your index and middle finger, pinch a good amount of flesh and pull hard. Repeat for 50-100 times until your patient screams like her finger is being cut off. Or with a porcelain spoon, dip into salt water, then scrap the skin on the back over and over until the area turns reddish-black. This hickey-looking scar last for a week and a half. 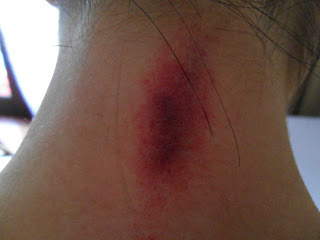 Result of "pau sa": no more headache after a couple of hours. So this month, not expecting the bad headache would return, I came to Bangalore without bringing a porcelain spoon. Again, after a full day and a half of very painful headache, "A" took me to a spa to get an Indian head massage. It was one of the most awesomest massages ever! Her touches were soft yet strong, gentle yet firm. I was in total bliss. She first parted my hair to apply some olive oil onto my scalp. Then she must've spent at least 45 minutes applying deep, long and careful strokes with her fingers and palms. Result of Indian head massage - instant relief!